Two sets in one, plus fairies and pixies come in light and dark skin versions to print as needed. Unusual solution with "presence" for a gift card which otherwise looks like a small gift (however big the amount it represents). ​Great fun and looks just super! There is space around the gift card to add sweets, choccies or something small like rolled up gloves or socks - and various little electronic gadgets. The fairies and pixies are attached to pockets and sit in the mugs. An envelope for the gift card fits in the pocket. 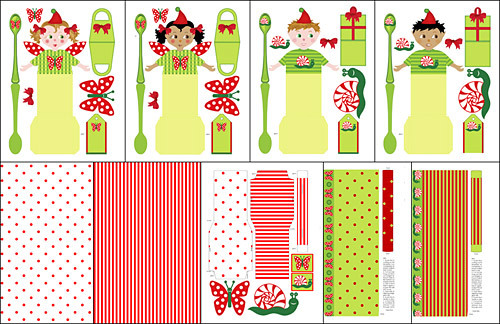 Each fairy and pixie holds a spoon and handbag or gift. Butterfly and snail critters are further mug decorations. Easy too, with instructions for mug included.